I’ve been in Japan this week – Tokyo, Kyoto, and Osaka. I forget how many times I have come to Japan, so I guess it’s the “umpteenth” time I’ve been here, but I always have a great time snacking through the streets and just wandering the cities. While I have been to Tokyo and Kyoto before, it is my first trip to Osaka. It’s known as the food capital of Japan – there is an Osakan saying “kuidaore” meaning “eat yourself into ruin.” I have certainly been doing that! Priority one was to try battera sushi. 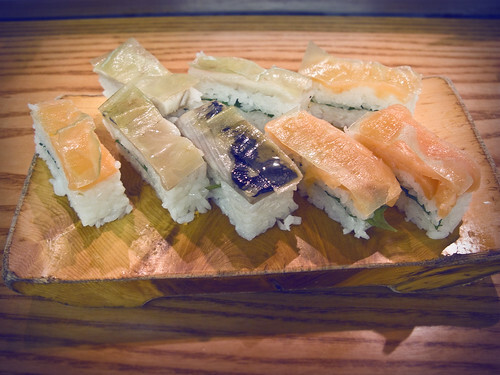 It’s basically a filet of fish placed into a box, filled with vinegared sushi rice, and then a strip of kelp at the top. Then a lid is placed on top and pressed down. Voila, boxed sushi! I’ve only had a couple pieces so far but I find it tasty with the main difference being a “denser” feeling while eating the rice. It’s amazing the variety of food concepts they have in Japan. Hopefully some of them will find their way to Singapore. Time to head out – today’s itinerary is to take the train to Kobe (only 30 minutes from Osaka), look around a bit and then eat some Kobe beef. A little sad that tomorrow I have to get on a plane to Seattle.